Once again I am joining in on Vintage Thingies Thursday hosted by ColoradoLady. 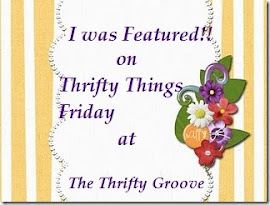 This week I visited one of my favorite thrifting spots! Our local Hospice thrift store has to be one of the cleanest second hand stores that I've ever been in. It's pretty well organized, and I often find a treasure or two. I love to collect sewing paraphernalia. So digging around in the craft bins, I came away with these little goodies. Most of them were 29c each. And at times they get in an assortment of crafting books, so I always check out the book section. This week this book on cross stitch patterns really grabbed my interest. It has some really cute patterns. But you know how it is when you have been searching for that one particular thing that you would really love to grab a hold of? Well it happened to me this week. As I was browsing through the books, I saw it! The one craft book that's been on my list for a long time. I almost couldn't believe it when I saw the title in the pile of books. 101 Patchwork Patterns by Ruby Short McKim. This was the Quilting bible back before quilt books were an every day occurence. I've looked for this book everywhere, and even online. I could buy a newer edition on the Dover website for $10, but when I looked inside this book, it was marked $1.00!!!! Wooo-hooo. Absolutely made my day! So what thrifting treasures have you found this week? Please check out ColoradoLady's blog and visit the other Vintage Thingies :-) Also check out Goodwill Goodies and Thrift Store Thursday on Holly's blog. What fun things to find in thrift stores! Today I am joining Kim from Shabby Pink and Pretty for Tea Things Tuesday. Please be sure to visit Kim's blog and check out the other ladies who will be showing their pretty tea things too! I found this Staffordshire teapot at Home Goods about a year ago. It was the prettiest teapot that I had found in a while. The large pink roses are so delicate. The Royal Albert cream and sugar set was purchased at an Antique mall while I was visiting my daughter in Chicago. And the mug was a gift from a dear friend. It is called "Rose of England". All these pieces seem to go together so well that I grouped them in my cabinet. If you enjoy looking at pretty china, be sure to visit Kim's blog. She not only shares her beautiful tea things, she also shares many of her vintage porcelain pieces. While on our trip through North Carolina a couple of weeks ago we stopped in an old antique shop. I can't even remember which town it was, but this building had been an old Bed and Breakfast and was converted into an Antique shop. It was a really neat building to roam around in. I found a knitting bag with some yarn inside. There was no price, so I asked "how much". The lady said $2.00. When I dug down inside, there was a whole container full of crochet needles. Surely worth more then just $2.00. My daughter was thrilled to have new size needles. As we traveled around in the area, we came upon this elegant building. Now I know absolutely nothing about golfing, but apparently this is THE place to golf when you are in North Carolina. It has been here since 1900. On one of our final evenings, we went to dinner at the Ellerbe Springs Inn, a very OLD Bed and Breakfast. And let me tell you, this place was OLD, but they made the BEST southern fried chicken that I have had in ages. So I guess the old adage of don't judge a book by it's cover, also applies to old hotels. Today is Vintage Thingies Thursday. Be sure to stop over at Coloradolady's blog and check out all the wonderful vintage, thrifty finds! I've also linked with Thrift Store Thursday and Goodwill Goodies. So please stop by both blogs and take a look see. So what treasures did I fine, you ask? Well you remember a few posts back when I mentioned that I've been collecting restaurant dishes, most noteably Buffalo china dishs? Well guess what I found at the Goodwill? I moved on from the aisle with china and looked around the store. Sometimes I find some good books. For some reason, I went back to the China/Housewares section and took another look. The only kind of fall leaves we have here in Florida come from Wally world or the craft stores. But that doesn't mean we can't enjoy the warmth of their rich colors in our homes. So even though this is typically a little early for me, I want to join in with everyone in welcoming Fall! Ooooo, I guess you will have to wait until tomorrow ;-) Tomorrow is Vintage Thingies Thursday. So come on back by and take a peek at what's in my bags tomorrow! 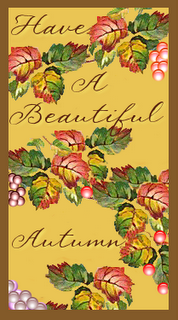 Pop over to Rhondi's Welcome to Fall Party at her blog. There are so many beautiful fall displays. Lots of wonderful warm and inviting homes to visit. This is a candid moment of my daughter and my niece captured at their Grandfather's 90th birthday celebration. I love this picture, mostly because these two are always cutting up together. The picture was the essence of their playful relationship. Please pop over to I Heart Faces and enjoy the many candid faces this week. This past weekend was spent in eastern North Carolina. I was sure that I would find some little treasure in our travels. We visited several antique shops, and even the Sleepy Poet in Charlotte which houses 55,000 square feet of antique goodies. I came away from our trip with no found treasure. But all is not lost! I paid a visit to our local Hospice Thrift store. They were busy restocking shelves as I browsed around. I found this pretty little glass plate. I thought it was so unique with the little handles. It goes very nicely with my fall candle. I also found these cute little fall pillows for about 50c a piece. I found this crochet piece in the bottom of a bucket that had napkins in it. Now let me tell you something. About 25 years ago, I saw one of these pieces at my hubby's aunts house. I loved it, and kept a look out whenever I stopped in an antique shop. Oh I've found them before, but they were BIG bucks. Well the buck stopped here, because it was a whopping $1.29 at the thrift store! And there still one more! And ooooo I am so excited about this one. All I can say is.......... keep thriftin'! Please be sure to stop by and visit Colorado Lady's blog as she hosts VTT. She has lots of places to scout out, who are showing off their vintage goodies today. I've also signed up with Thrift Store Thursday. Take a peek! It's so fun to explore new places when we travel. This past week we were near the Charlotte area of North Carolina. It is a booming little town with some delicious sweet Southern Ice tea. One day we ate in this really quaint tea room that was housed in a building that must have been built around 1900. Loved the gorgeous ceiling lighting fixture. We made it into an Antique mall called The Sleepy Poet. Even found the Olde Tyme Marketplace booth ! This was a really neat sign we saw in front of an old store. It says "Westinghouse Appliances". The old store was converted into something else now, but the sign was a reminder of times past. It's so fun to find a thrifty deal. I sometimes go to antique malls, and look at all of the beautiful (and expensive) goodies. But then I head to the Goodwill or Hospice Thrift stores to find a bargain. On Saturday, I found a thrift store that was having a Grand Opening. This store had a LOT of clothing, and not very many household items. But I did find this little juice glass. This was the first time that I found one in this size. I've collected many glasses in this pattern, but they are all the normal size glass. It was a grand total of 39c. Sheffield Cutlery made in England, with a lifetime blade :-) These were in a box with other utensils. One box said 59c and the other 69c, so I wasn't exactly sure how much they would cost. When I went to check out, there was a new girl at the register. She did not know the price either. She started to ask me, but the other guy behind the counter told her they were 19c each!! She looked at him, and he showed her a paper and she agreed. WOW! The two pieces came to a whole 38 cents. So it was a happy Saturday for me. Hoping to find more great thriftin' bargains this week. 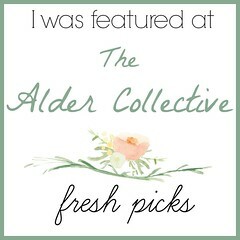 Join ColoradoLady and visit the other Vintage posts at her blog. Happy VTT! As we have traveled around, we've seen so many interesting old houses. It sometimes amazes me to know that these old houses have withstood the test of time and the elements. Kind of makes you wonder if they will be around for another hundred years. You know what I read in the paper yesterday?? In the Parade section of the Sunday paper there was an article titled "Secrets of Secondhand Shopping" by Carmen Wong Ulrich. With thritfing being the current rage, she had some pointers about finding the best deals. Well if you have been junking for a while, you know all the pointers. But I had never heard of narts.org (The National Association of Resale and Thrift Shops) website before. It lists many thrift stores around the country. She also listed shopgoodwill.com and shophousingworks.com . Even the government has a website at govdeals.com (click on "Government Property for Sale"), and govsales.gov . Have a happy thriftin' week! It just looked so old fashioned, and of course it was pink :-) That was about five years ago. The summer sure has gone by so fast. And now we are heading into Fall which leads up to the holiday season! Had to share what my daughter found in a recent antique store visit. I love old chairs. There is just something about their charm and grace that is so inviting. Whenever I see an old chair in an antique shop or a thrift store, I want to bring it home with me. Of course that is just not possible. But there should be a sign outside my house - "Home for wayward and lost chairs". Recently my daughter was making some changes in her room when "the" dresser came to live with us. She asked if I would swap a chair that she had in her room for a smaller one that I had in our living room. I thought it was a great idea, and in the process, we moved furniture in the living room around too. I've fallen in love with this chair. It is big, and comfy AND short :-) I'm not very tall, and sometimes my feet barely reach the floor when I sit in an easy chair. This chair has compassion for shorter people. It's old and bumpy, but it encompasses me with it's warm inviting arms. I can sit in this chair and read, or watch the butterflys outside. It's a dark dreary rainy day here today. Come, sit with me for a while. Join me for a cup of tea, or we will wrap ourselves up in a good book. "Oh, the comfort, the inexpressible comfort, of feeling safe with a person, having neither to weigh thoughts nor measure words, but to pour them all out just as they are, chaff and grain together, knowing that a faithful hand will take and sift them, keep what is worth keeping, and then, with the breath of kindess, blow the rest away."